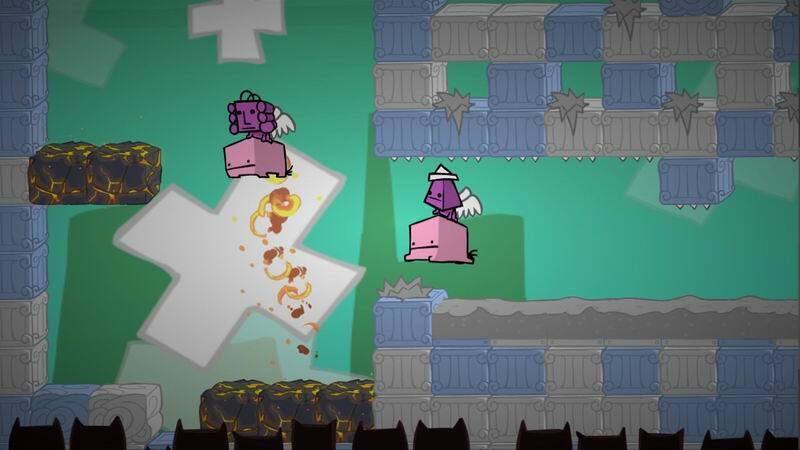 BattleBlock Theater is one of those eclectic, random-humor games cut from the same cloth as Super Meat Boy or Splosion Man. 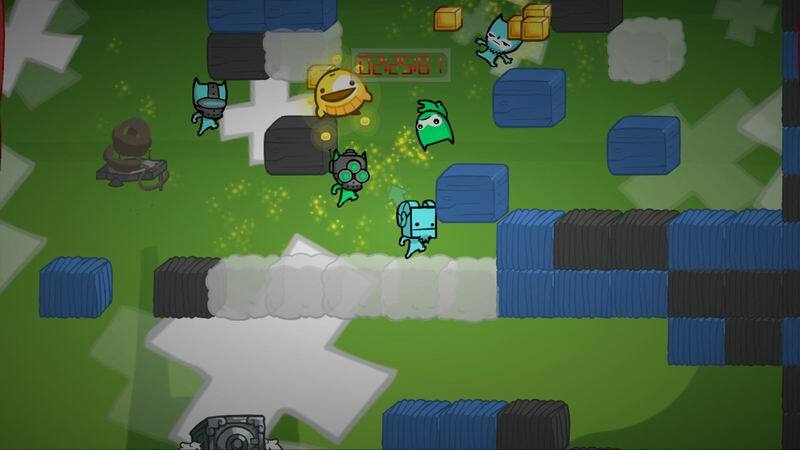 Following the model used in The Behemoth's Alien Hominid and Castle Crashers, BattleBlock takes a classic gameplay style, renders it with handdrawn animations, and drops in a truckload of cartoon violence for good measure. Just as with Behemoth's former entries, while the reliance on over-the-top humor quickly becomes old hat, BattleBlock is still a blast to play, especially if you have friends who can take advantage of the co-op options. BattleBlock Theater opens with a large group of friends setting out on Hatty Hattington's yacht, the "Friendship," for excitement and adventure. Their initially high spirits are dashed to pieces when a storm runs the ship aground on a ruined island populated entirely by an advanced society of cats. 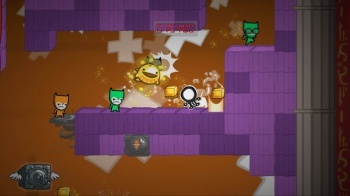 The crew is captured and forced into the titular BattleBlock Theater, a series of deadly survival challenges performed for the felines' fiendish amusement. Hatty, meanwhile, turns against his friends after a glowing red top hat transforms him into the cats' leader, and your personal oppressor. It's an interesting premise and setting, and while the story and gameplay barely intersect during play, it generates just enough danger and interest to keep you eagerly awaiting the next post-level cutscene. If you've played any of Behemoth's previous games, you'll already be familiar with the iconic art style that permeates its work. Pleasing hand-drawn animations are out in full force, as is the insane cartoon violence that is more exaggerated and laughable than it is disturbing. Admittedly, BattleBlock Theater's lighthearted tone seems like it would clash with the story at times. Within the first ten minutes, you've seen friends killed, loyalties betrayed, unjust imprisonments, and a totalitarian cat society that threatens lives for its own amusement. Of course, the moment cats come into anything, it's pretty clear that you're in for a very silly game. Behemoth wants you to have fun in this world, not dwell on how bleak it is. You're supposed to bounce your head to the incredibly upbeat music and laugh at the narrator's reactions to outrageous in-game deaths. The threat of your enemies is as over-the-top as any other game element, and BattleBlock Theater is more enjoyable for it. 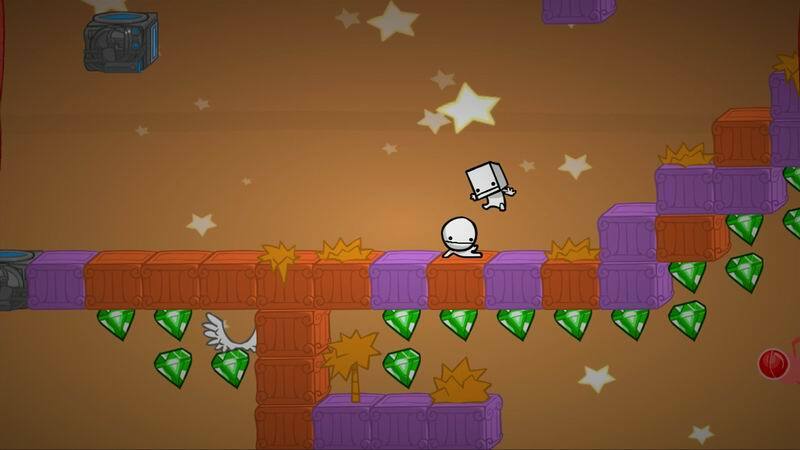 Your goal in each level is straightforward enough: Gather at least three of seven green gems and reach the exit. The challenge comes from navigating environments constructed entirely out of stacked blocks, some of which are incredibly hazardous to your health. Outside of standard blocks which you can walk across, you have sticky blocks, spiked blocks, volcanic blocks that fling you in the opposite direction, and many more. The principles and mechanics behind each block are easy to grasp, but each level provides more than enough unique scenarios to keep things challenging. 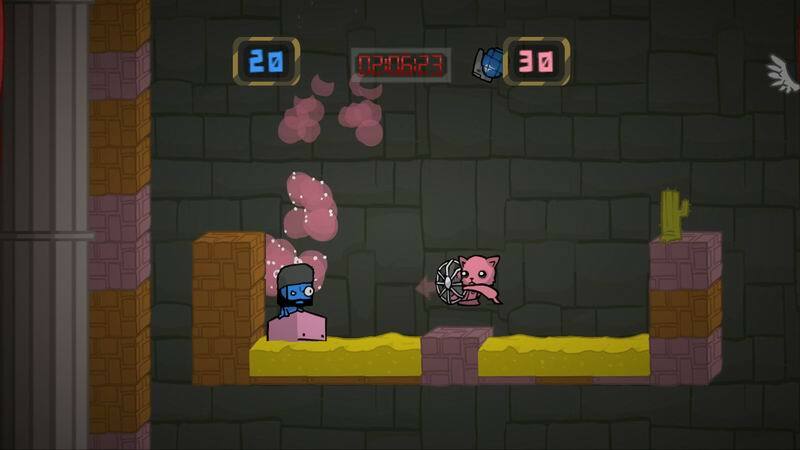 When puzzles become complex enough to require multiple attempts, usually from hilariously unexpected death sequences, instant respawns keep the game from slowing down. This is particularly helpful because you'll also have to avoid enemy units like fast-punching cats, rocket-spewing robots, and even a giant man-eating raccoon monster. Despite the seemingly random design of each foe, they aren't simply thrown in for novelty's sake. 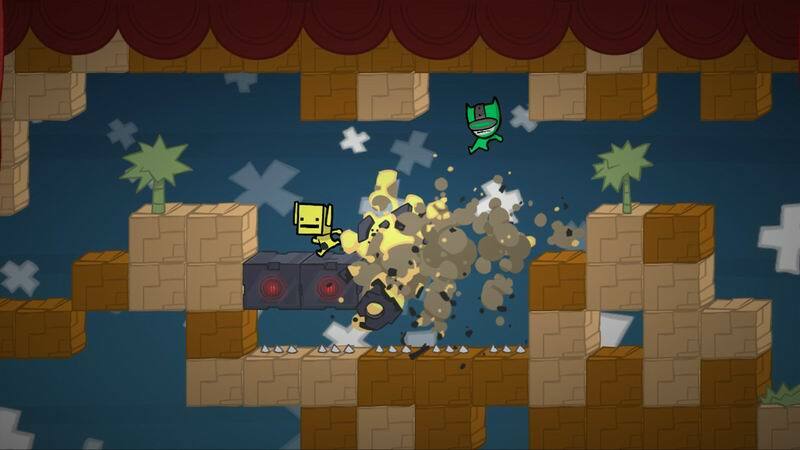 Each enemy poses a unique obstacle on par with puzzle blocks themselves, and prevents BattleBlock Theater from becoming a series of static challenges and empty rooms. If you ever get tired of avoiding opponents, you can eventually unlock special weapons to dispatch them, including frisbees, vacuum cleaners, and an exploding frog. You can only equip one weapon at a time, and they're not necessary for solving puzzles, but it sure is cathartic to wipe out incoming cats via increasingly creative methods.